The brick wall that has stumped me for a long time is my third great grandmother, Susan Rood, b. 1799. I am summarizing what I know about here as a public research log. The embroidered sampler that twelve-year-old Susan Arville Chapin (1820 - 1906) created in 1832 shows her mother's maiden name of Susan Rood, and her birthdate of January 26, 1799. It also shows her marriage date of September 17, 1816, to Orramel Chapin, for whom I've found information. Orramel Chapin is descended from Deacon Samuel Chapin, who helped found the city of Springfield, Massachusetts. Samuel Chapin has thousands of descendants and a few genealogies have been written, trying to keep track of all those descendants. 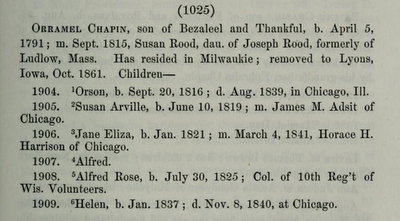 The Chapin Genealogy, published in 1862 by Orange Chapin, is an early compiled genealogy and it contains many errors. The copy that has been passed down in my family has all kinds of handwritten notes, correcting dates. Following image is from page 125 of the book which can be found at the Internet Archive. More recently, I explored Hampshire County probate records on microfilm at the New England Historic Genealogical Society and, in a nutshell, entries for Joseph Rood of Ludlow from 1806-1808 indicate his wife is Paulina and his minor children are Joseph and Paulina - no Susan. 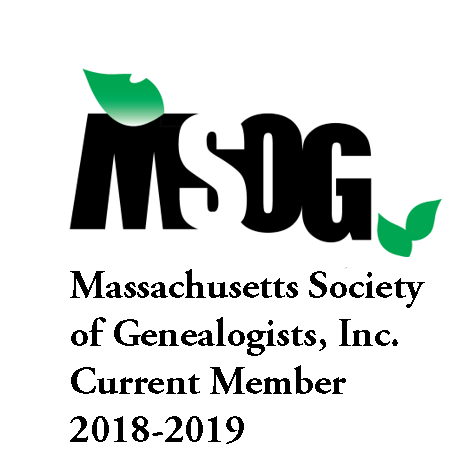 Periodically, I enter Susan Rood and Joseph Rood into search engines at AmericanAncestors.org, FamilySearch.org, and other websites, but haven't found anything that confirms the name of Susan's parents. There are Rood families in Connecticut and in New York, as well as Massachusetts, and I'm not sure how they are related. 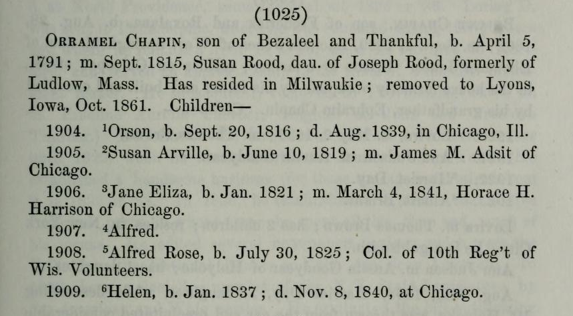 The Chapin book of genealogical data, with brief biographical sketches, of the descendants of Deacon Samuel Chapin, published in 1924 by Gilbert W. Chapin indicates that Susan Rood was of Sangerfield (Oneida County), New York. 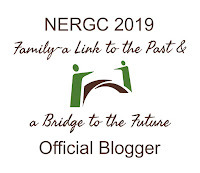 I recently received a reply to an old query of mine on a rootsweb message board from a Rood researcher who has been exploring the Sangerfield, New York Rood family. 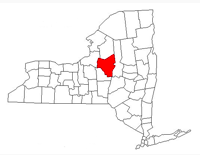 My next step is to learn about Oneida County, New York resources. I wonder how Susan Rood and Orramel Chapin met and decided to marry if he was born in Springfield, Hampshire County, Massachusetts, and she was born in Sangerfield, Oneida County, New York.